Oskar, what are you so pensive about? You are in such deep thought. Oh sweetie, what's on your mind? You're possibly making considerations about the meaning of life or something, ain't you? I suspect you are keeping watch for the demon squirrels. Good job, Oskar, I will protect Waterford, from my end. Oskar – and we say this in the most manly of ways – you are one handsome pup! Schnauzer snuggles – JD and Max. As always, JD & Max are right on the money! 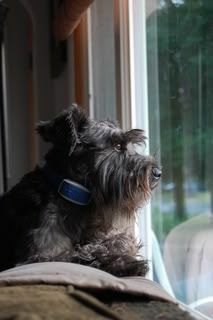 We Schnauzer do have lots to think about; it's a tough life but someone has to do it. And.. yes… wow… you are soooo beautiful! A penny for your thoughts, Oskar! Bet you are pondering something deep and philosophical – like "I wonder what's for dinner". Aw….those are just the most beautiful pictures!! 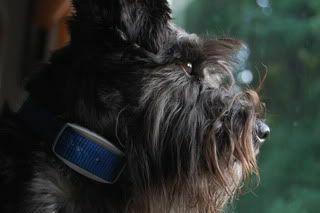 My human says she loves seeing dogs heads in profile – so full of character, the different breeds! Thinnkin' about you too Oskar! Hi Oskar – Thank you for stopping buy and checking out our blog. Just click on the center of the Guest Book and it will take you to the signature page… Let us know if you're still having problems and we'll have our person change the layout….